The C.V. Huenemann Lectureship in English will host the husband and wife team of Lee Slonimsky and Carol Goodman on campus March 4-5. At 7 p.m. March 4 in the Student Union Building Alumni Room, Slonimsky and Goodman will discuss their personal histories with the liberal arts. Though Slonimsky’s degrees from City College of New York are in English and creative writing, he is the manager of a hedge fund. Goodman is a Hammett Award-winning fiction writer who holds a Master of Fine Arts in creative writing from The New School and a bachelor’s degree in Latin from Vassar. Slonimsky and Goodman will give a reading from their respective works in poetry and fiction at 7 p.m. March 5 in the Student Union Building Alumni Room. They will also share a sample from their collaborative work in urban fantasy, which they have published under the name Lee Carroll. Both presentations are free and open to the public. This year’s C.V. Huenemann Lectureship in English is sponsored by the School of Business, the School of Arts and Letters, and the Department of English and Linguistics. Calvin V. Huenemann was a former head of the Division of Language and Literature who was instrumental in establishing the English graduate program. He came to Truman in 1956 and retired 25 years later. The C.V. Huenemann Lectureship in English provides Truman English students with a learning environment of renowned scholars. The lectureship was created in 2007 with a gift from Dr. Gail B. Crump through Truman’s “Bright Minds Bright Futures” campaign. In addition to commemorating Crump’s nearly four decades of distinguished service in teaching English, the lectureship also recognizes the preparation he received as an undergraduate student of Huenemann. Crump received Bachelor of Arts and Bachelor of Science degrees from Truman in 1964 and is a retired professor of English from the University of Central Missouri. The Student Activities Board Spring Concert will feature musical artist Lee Brice at 8:15 p.m. May 3 at Red Barn Park (rain site: Pershing Arena). Doors will open at 7:45 p.m. The event is free for students, faculty, staff and general admission. Rain site vouchers will be available for students starting March 27. Vouchers for faculty, staff and general admission will be available April 3. 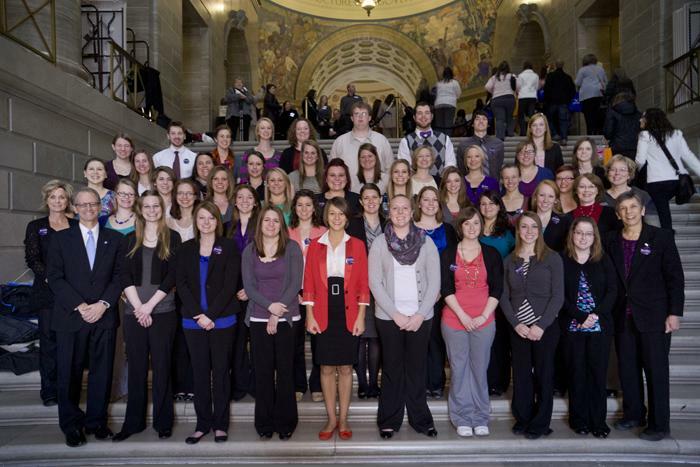 Truman nursing students and faculty members, along with President Paino, stand on the Missouri State Capitol steps in Jefferson City during Nursing Advocacy Day, Feb. 20. Truman athletic training students and faculty members, along with President Paino, stand on the Missouri State Capitol steps in Jefferson City. 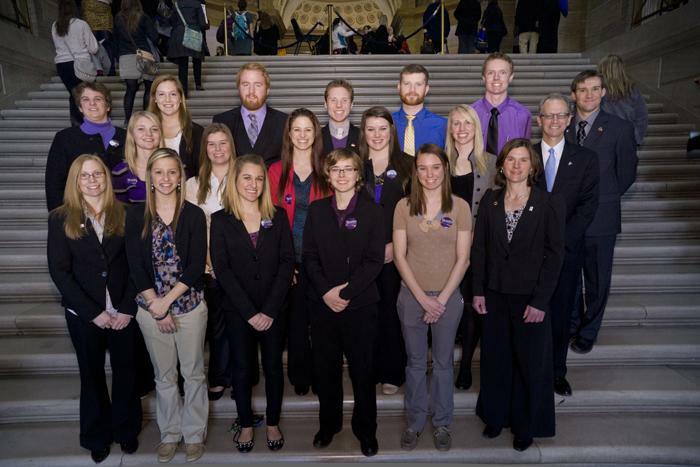 The trainers visited the Capitol Feb. 20 to meet with Missouri legislators about the athletic training profession and Truman State University. Lucy Lee, professor of Spanish, has been elected president of Sigma Delta Pi, the National Collegiate Hispanic Honor Society, for the 2013-16 triennium, beginning July 2013. Lee will succeed Marquette University’s Dr. Germán D. Carrillo, who has been at the helm more than 14 years, the second-longest presidential term in the 92 year history of the organization. In her role as Sigma Delta Pi’s 24th president, Lee will chair the National Executive Council and Executive Committee and work with the executive director in overseeing all national operations. Lee brings a wealth of experience and accomplishment to the presidency. She has served as regional vice-president of the Southwest since 2001, as executive committee member-at-large since 2007, as Truman State University chapter’s adviser since 1989 and as Missouri state director from 1992-2001. As a result of her exemplary work with students at Truman, she was named top adviser in the country in 2010, and under her direction her chapter has received numerous national awards for its activities. Established in 1919 at the University of California, Berkeley, Sigma Delta Pi honors those who have completed three years of study of college-level Spanish, with a minimal grade point average of 3.0 in all Spanish courses taken. Candidates must also rank in the upper 35 percent of their class--sophomore, junior, or senior--and must have completed at least three semesters or five quarters of college work. Graduate students may also be elected to membership upon completion of two graduate courses in Spanish which will make them eligible for a graduate degree. With 587 chapters nationwide and its national office at the College of Charleston in South Carolina, Sigma Delta Pi is a member of the Association of College Honor Societies, the nation’s only certifying agency for college and university honor societies. Remember to file the 2013-2014 Free Application for Federal Student Aid (FAFSA) located at fafsa.gov to determine Title IV federal aid eligibility (Pell Grant, SEOG, Perkins Loan, Work Study, Stafford Direct Loans, PLUS Loans). FAFSA results are also needed for some other federal, state, University and private programs. The state’s FAFSA filing deadline for the Access Missouri Grant Program is April 1. Do not delay due to late tax filing – the FAFSA allows the use of estimated information – just update the FAFSA record after the 2012 income tax figures are finalized. Later FAFSA filing may result in more limited funding options. Contact the Financial Aid Office (McClain Hall 103, 660.785.4130) for additional information. Registration for the Big Event for both community members and students will be open until 5 p.m. March 8. This year’s student registration will be conducted through TruService, the SERVE Center’s online service database. The link can be found on the left side of the SERVE Center’s web page serve.truman.edu. Each student will have to register individually, but there will be a field to select an organization. Community members can sign up to receive assistance via the Big Event by calling the SERVE Center at 660.785.7222 or going directly to the Big Event website, serve.truman.edu/bigevent. All students, faculty and staff are encouraged to sign up to receive emergency notices through the text messaging function on their phones. This can be done by signing up through TruView. On the TruView main page under “Update and View My Personal Information” click on “Emergency Text Messaging.” University announcements will also be sent by email and posted on the home page. If you do not have access to text messaging or the Internet, work with a friend or a supervisor, on how you can best access the information. The Emergency Response Guide is also available on the DPS website at police.truman.edu. March 8: 6:30 a.m.-7 p.m.
March 8: Close 5 p.m.
March 11-15: 7 a.m.-5 p.m.
March 17: Open 5 p.m.
March 8: 7:30 a.m.-10 p.m.
March 11-14: 7:30 a.m.-5 p.m.
March 17: 7:30 a.m.-10 p.m.
Truman’s Department of Nursing received approval from the Missouri State Board of Nursing (MSBN) to offer an accelerated (second baccalaureate degree) Bachelor of Science in Nursing (A-BSN). After completing pre-requisite courses, the A-BSN can be completed in 15 months of class and clinical experiences. Representatives from MSBN will visit the Department during Spring 2013. The Bulldogs will host Southwest Baptist University at 7 p.m. March 5 in Pershing Arena. This game will mark the first round of the MIAA tournament. Truman students who arrive to the game prior to tip off will be admitted to the game free of charge. After tip off admission for students is $5. Admission for adults is $10. Season passes cannot be used for admittance. The library is currently featuring a display based on the History Channel’s series “10 Days that Unexpectedly Changed America.” Events included are not those which immediately come to mind when reflecting on our nation’s history. However, they were crucial days in American history that ultimately transformed our country. This exhibit will be available for public viewing until March 29. Truman uses assessment data to allow the University to get a clear picture of where Truman students and faculty are excelling as well as where they need more assistance. In an effort to remind the campus of what is assessed at Truman and where they can find the assessment results, the assessment committee will be highlighting several of assessment topics in the next few weeks. According to the National Survey of Student Engagement (NSSE), in 2012 Truman students reported spending more time preparing for class compared to the other 545 schools who participated in the Survey. However, Truman students also reported that they spent more time on co-curricular activities and volunteer work, and about the same amount of time relaxing and socializing as students at the other universities did. You can access this data, as well as other interesting facts about how Truman is doing via the Assessment Almanac, at assessment.truman.edu/almanac/index.asp. With hundreds of events taking place on campus each month, it can be difficult to keep track of everything. The University Master Calendar can help. All events listed on the University Master Calendar can be easily incorporated into Outlook, iCal and other personal planners by clicking “export” at the bottom of each event. Another option is to get an email notice by clicking on “notify” at the bottom of an event. Organizations and departments hosting on-campus events are encouraged to submit events to the Master Calendar at calendar.truman.edu. The 2013 Fulbright Summer Internship program offers students the opportunity to experience revered academic programs in the U.K., while also exploring the rich culture, heritage and history of the region. The majority of the participant expenses are covered by the Summer Institute. This may include round-trip airfare, tuition and fees at the University, accommodation, and various living expenses. In addition to the six programs traditionally offered by Fulbright, including cities such as London, Cardiff and Belfast, the program will feature three new locations at the Scotland Summer Institute, the University of Bristol and the University of Exeter. The internship is open to students in all courses of study. Students must be a U.S. citizen and possess a valid U.S. passport. Those holding permanent residency through a green card may not apply. For more information and application forms, visit fulbright.org.uk/fulbright-awards/exchanges-to-the-uk/undergraduates. Applications are due by March 11. The Scholarship Foundation of St. Louis is a non-profit organization that provides access to higher education to St. Louis area students through interest free loans. The program assists students with financial need. Applicants must have a minimum cumulative 2.0 grade point average, demonstrate good character and must be a permanent resident of St. Louis City, St. Louis County, the Missouri counties of Franklin, Jefferson, Lincoln, St. Charles, Warren and Washington or the Illinois counties of Bond, Calhoun, Clinton, Jersey, Macoupin, Madison, Monroe or St. Clair. Applications are due April 15. For more information, call 314.725.7990 or email info@sfstl.org. Curtis R. Blakely, assistant professor in justice systems, has published a paper in the Prison Service Journal (March issue) entitled, “Thermodynamics, Newtonian Motion, and the Prison: The Effects of Energy, Entropy and Mass on Rehabilitation.” This paper continues Blakely’s work with socio-physics and its application to penology. Jennifer G. Jesse, professor of philosophy and religion, has had her book, William Blake’s Religious Vision: There’s a Methodism in his Madness, published by Rowman & Littlefield. Daniel Mandell, professor of history, recently had a new work, “Revolutionary Ideologies and Wartime Economic Regulation,” discussed as part of the Boston Area Early American History Seminar series. The Department of Nursing will host an Accelerated Bachelor of Science in Nursing (ABSN) Information Session from 4:30-5 p.m. March 4 in Health Sciences Building 3205. After completing a bachelor’s degree and the specified pre-requisite courses, admitted students may finish a BSN degree in 15 months of study. For additional information, email nursing@truman.edu or call 660.785.4557. The nursing website includes information about the curriculum at nursing.truman.edu. Author Ryan Sallans will present “Scouting the Unknown” from 7-9 p.m. March 5 in Violette Hall 1000. Sallans will discuss his transition from female to male, anorexia and relationships. This event is sponsored by the Eisenberg Speaker’s Fund, IDS, SHSE, SCS and the Department of Psychology. For more information contact spalmer@truman.edu. The Physics Colloquium will continue at 4:30 p.m. March 6 in Magruder Hall 1096 with a presentation by Ryan T. Gordan from the Western Illinois University Department of Physics. FAC Fall Funding Applications are now available in the FAC Office (Student Union Building 1109 A). Any groups or ICA teams wishing to receive funding for next fall must submit an application this semester. For questions, contact tsufundsallotmentcouncil@gmail.com. Applications for funding are due March 6 in the FAC Office. Concert Band and Wind Symphony II will perform at 7:30 p.m. March 6 in the Ophelia Parrish Performance Hall. Winter volleyball clinics will continue from 1-3 p.m. March 9 in Pershing Arena. Truman coach Ben Briney, his staff and players will be available to provide one-on-one and group instruction to players ages fifth grade and older. Cost is $15 per session. For more information, contact Megan Wargo-Kearney at 660.785.7751 or mwargo@truman.edu. Walk-ups are welcome. The Quincy Symphony Chorus will present “Revisiting Childhood” at 7:30 p.m. March 9 at the Salem Evangelical United Church of Christ in Quincy, Ill. Admission is free with a Truman ID. The performance will include popular TV themes, jingles and songs from the 50s, 60s and 70s, plus famous Broadway duets from the time. Truman and A.T. Still University professors Alex Tetlak and Rachel Ruhlen will conduct “Bicycling with Traffic” March 10, 13 and 17. The class teaches cyclists how to use a bicycle with confidence and competence for pleasure, utility and sport in various highway, climate, terrain and traffic conditions. Classes will met from 2-5 p.m. March 10, 5-8 p.m. March 13 and 2-5 p.m. March 17. For more information, go to ka-motion.org or contact atetlak@truman.edu. Bicycle, helmet and registration are required. The Center for Academic Excellence and the School of Business are recruiting academic peer mentors for the 2013-2014 academic year. Academic peer mentors support the professional and faculty advising staff by providing an academic outreach program to first and second year students who are accounting and business administration majors, or who are considering these majors. Applicants must be juniors or seniors by the Fall 2013 semester, and must be accounting or business administration majors. A job listing may be viewed on TruPositions under “Academic Peer Mentor.” Applications are available in the Business Academic Advising Center, Violette Hall 2413, and are due March 18. The American Association of University Professors (AAUP) will host its monthly meeting at 4:30 p.m. March 19 at the University Club House, 516 E. Patterson. Contact Marc Becker at marc@truman.edu or call 660.785.6036 for more information. Beta Alpha Psi is sponsoring Volunteer Income Tax Assistance (VITA), a free tax return preparation and electronic filing program from 8 a.m.-3 p.m. March 23 in Violette Hall 1424. Taxpayers should be sure to bring proof of identity; copies of all W-2, 1098, 1099 forms and any other tax forms received in the mail; social security cards for all individuals listed on the tax return; and banking information if a direct deposit is desired. For more information, call 660.785.4378. The Gold Medal Concert will take place at 8 p.m. March 23 in the Ophelia Parrish Performance Hall. Winners of the Gold Medal Competition will perform as soloists with the University Orchestra. Fruit and vegetable production internships are available at the University Farm for this summer. Detailed information is available at agriculture.truman.edu/farmtoschool/F2S_Internship_Description-FINAL_2013.pdf.